In Lisbon, there’s a part of the city where your map isn’t likely to help you. It’s a dense warren of narrow cobblestoned streets and alleyways spread across a hillside. Take one turn, then another, then another, before realising you’re right back where you started. The only certainty is that some streets lead generally uphill, and others down. You start to recognise the same doorways and turnings, the same window boxes, the same bars, but you can never be quite sure. It’s easy to get lost in Alfama, and that’s a real joy, because this is a real neighbourhood, complete with washing lines, budgies chirping from their balcony-balanced cages, barbecues sizzling with sardines, and people deep in conversation window to window, passing or receiving the day’s’ gossip. To wander around Alfama feels akin to stepping into somebody’s home, and the more you wander, the more familiar it becomes … the same couple of puppies playing in a courtyard, the same woman at work painting tiles, the same kids on their bikes, haring around with little regard for anything. There are restaurants, too, plenty of them. Santo António de Alfama is tucked into a corner just off one of the main squares, a spot where people sit and listen to the excellent fado trio another of the restaurants on the square proper hosts every night. Many people sit on a certain set of steps, watching the world pass by without realising that just behind their backs hides one of Alfama’s, and indeed Lisbon’s, little jewels. Under a canopy formed from a huge grape-vine is an open courtyard, surrounded by half a dozen apartments, their front doors and comings and goings mingling with diners sat at slightly battered tables, whilst inside, there are three cosy and warm floors of tables, adding up to a large capacity that can cater for anything from a romantic dinner to a large group meal fairly easily. 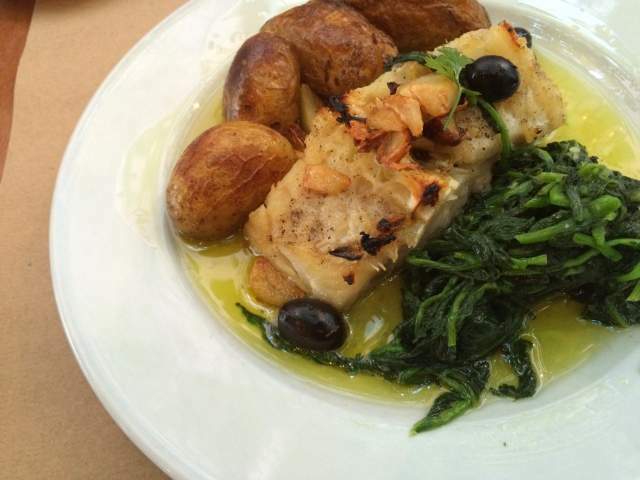 Santo António’s food treads the well understood line of Portuguese cuisine – plenty of fish, plenty of meat, lots of potatoes – but with an approach that takes this essential simplicity and makes it much more interesting. 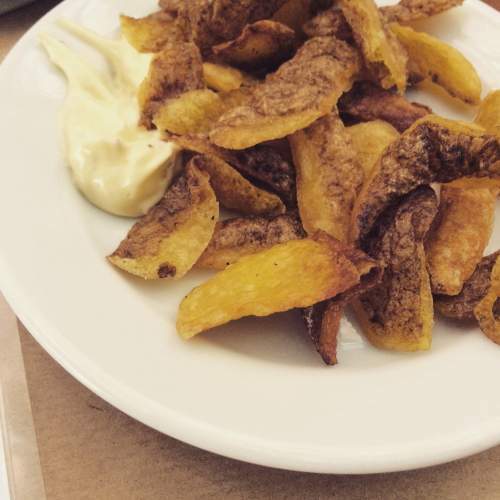 Take their appetiser of fried potato skins … a simple dish, just thick slices of potato fried in the style of chips, but served with a lovely piquant mayonnaise. I know the Belgians have done this sort of thing for centuries, but follow that up with something like a beautifully roasted piece of salt cod, served with the greens from a turnip, and it all starts to feel a little special. The same, but different … essentially the same food you can eat in dozens of places around Lisbon, but done a little differently, a little better. The terrace is a show-stopper on a warm summer night. It’s a wonderful space, and sitting underneath that huge vine, heavy with grapes, while skimming through an exceptional wine list feels very special, but there is more to Santo Antonio’s than a blockbuster opening worthy of the film stars whose photographs festoon the walls. The food matches the billing. We spent four nights in Lisbon and another week in Portugal, and this was the best food we ate, in the best location. Many gorgeous looking restaurants fail to deliver on the plate, but this is not one of them – it delivers in a simple, relaxed and informal way that leans towards the elegant and sophisticated. Well worth a quick trip around that corner.